Gozosa SCS — Origin P.R.E. Gozosa SCS is a 2012 PRE filly sired by Dominante XXIX out of Fantasia Del C (both Qualified). Gozosa SCS, named for her maternal grandmother, an exquisite mare imported from Spain by Barbara Currie, was up and standing within moments of her birth. 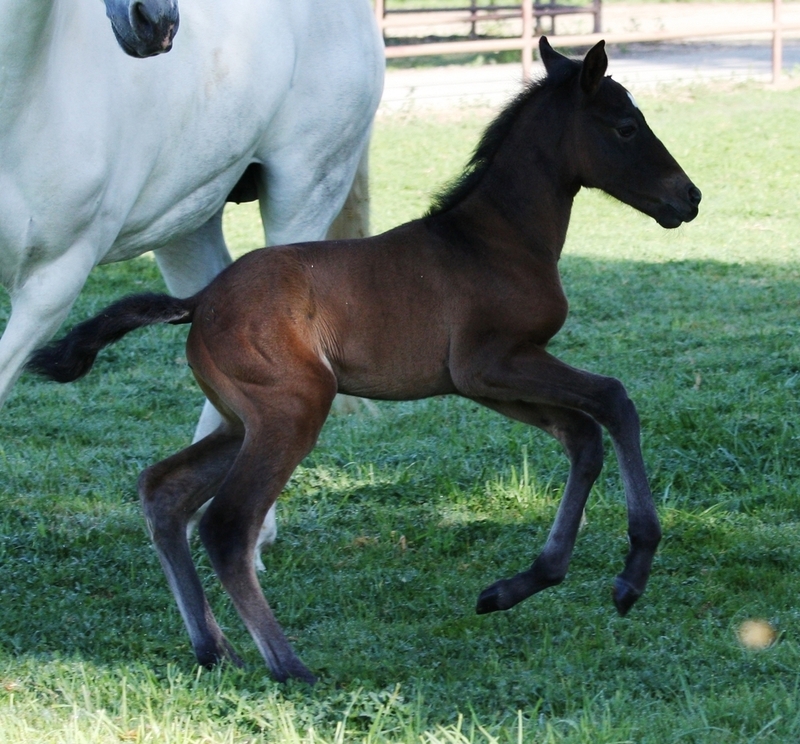 She was galloping circles around her mother at 3 hours old and performing impressive airs above ground at 3 days. Since she needed absolutely no assistance at birth (and didn't want any), we weren't sure this one was even going to be friendly. Her little world changed dramatically when she realized that humans provided much needed scritchy-scratchies, and she's had the easiest temperament ever since. Those who know her dam and grand dam well know that scratches are the way to this mare line's heart. Gozosa SCS in June of 2014 (26 months). "Little" Gozosa was already 15.2 hands at 17 months, and is now a 16.2 hand 4 year old. She has inherited her dam's lovely conformation and big trot, her sire's lovely temperament, along with his fluid and balanced canter and walk. This filly will win in the conformation ring, but she will really shine in the dressage arena with gaits that rival any warmblood. Gozosa SCS carries the brand of Origin P.R.E., has her ANCCE, IALHA, USEF, & USDF papers in hand. Gozosa is not for sale at this time.